Mul-T-Locks high-security C Series sliding-bolt padlock is for general use. It is operated with a rotated key of 55 degrees to unlock. The bolt release is spring loaded. The lock is available in Black or a nickel finish. The shell consists of hardened shell while the core is made from Black-plated solid brass. The spring-loaded bolt is made of a hardened boron alloy steel. It also features Mul-T-Locks pin tumbler system, which is pick- and drill-resistant to keep a high-security standard. A protective shutter prevents dust contamination damaging the lock. It comes with a reversible nickel silver key with plastic key head and coloured insert for identification. The key is also available completely in nickel silver. 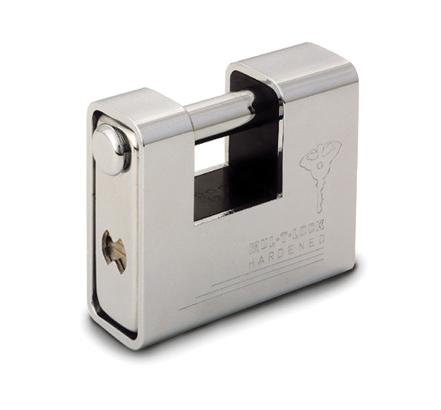 The SBC sliding bolt padlock is finished to security grade CEN 4. The cylinder comes in classic, interactive and MT5 platforms and padlocks can be keyed differently or alike with master keys.